Water is crucial for life. It is used for farming crops and livestock, manufacturing and industry, for towns and communities, for the environment and river health. After water is used some of it can return back to the river system – this water is known as a ‘return flow’. or by seeping into the ground, and pushing groundwater into the river – this is called a groundwater return flow. Groundwater return flows can take decades to return back to rivers, and not all groundwater aquifers are connected to rivers. Some water does not return to the river system but remains in groundwater aquifers. 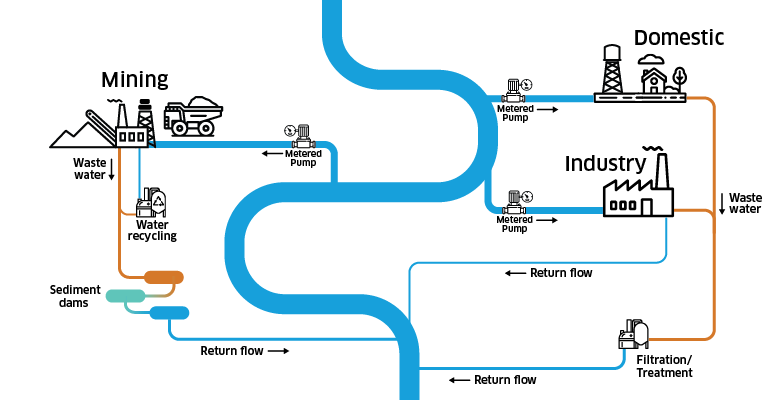 The quantity and quality of return flows vary depending on many factors, for example how the water was used and how it returns back to the river system. 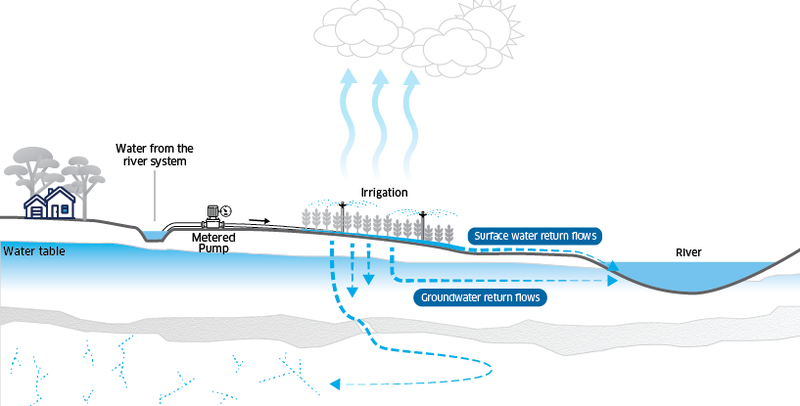 Some return flows provide water that can be used again, like return flows from wetlands. Conveyance water is often used to transport water to users. For example, some conveyance water is used to fill irrigation channels so water for irrigation can be delivered using gravity. Some of this conveyance water can return to the river as a return flow. 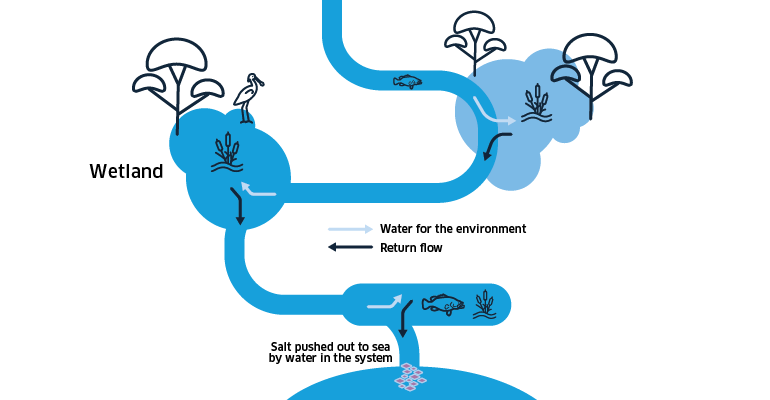 To prevent unwanted salt and nutrients entering the river system and reducing water quality, surface water return flows have been substantially reduced. Some groundwater return flows are also deliberately being reduced to protect the water quality of our rivers. Groundwater at some locations is extremely saline. The Murray–Darling Basin system includes rivers and lakes, wetlands, floodplains and groundwater. It is a large, complex and connected river and groundwater system. With the Basin Plan, this is the first time the system will be managed as a whole. 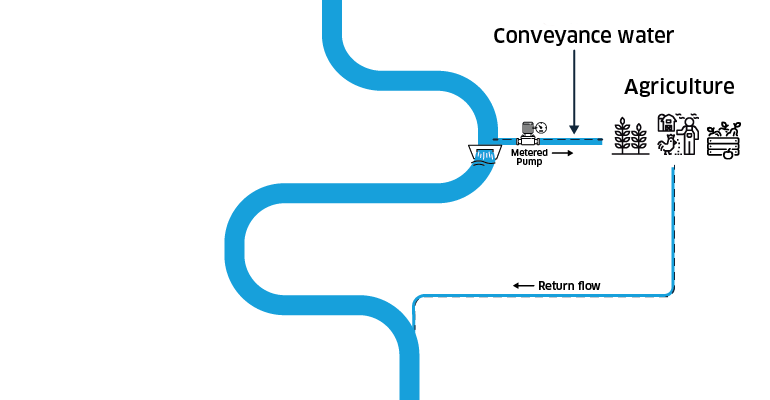 Accounting for water as it moves down a river and is used is complex. A considerable amount of water is taken from our rivers for consumptive use. Modernising irrigation practices to save water is a key part of the Basin Plan. Irrigators have been adopting more efficient irrigation practices for more than 20 years to reduce water costs and mitigate water logging, soil salinity and water quality issues through reducing irrigation return flows. The Basin Plan accounts for many return flows in its planning and implementation. The Murray–Darling Basin Authority (MDBA) expects science and evidence on return flows to improve and for the management of the Basin’s water resources to continue to evolve. The Basin Plan is an adaptive plan. The MDBA will monitor, evaluate and report Basin Plan outcomes, and there are opportunities to review the plan as new information, including on return flows, becomes available.